June 1st is looming. Winter is right here on our doorstep. We have lashings of rain, thunder (which I hilariously read the other day being referred to as Angel farts), lightning, and it is cold. Very cold. And going to get even colder if the weather experts are to be believed. 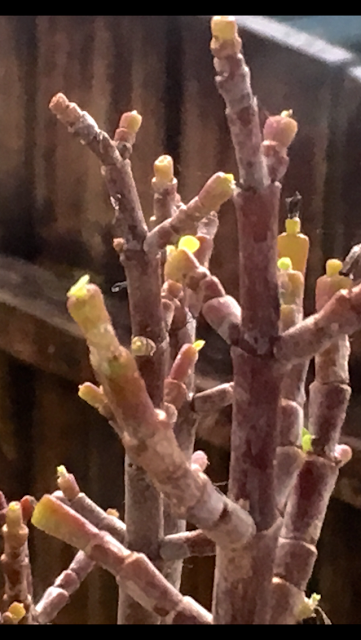 So it was a bit of a shock to see our Jade plant, the smaller of the money trees, full of new buds. The larger money tree has flowered, and this one has decided now would be a good time to have a growth spurt. I hope the young'uns aren't in for too much of a shock when the expected polar blast hits this week Fortunately we do not see snow here, but with the nearest snow fields a three hour drive away, we certainly do feel when it is snowing. May 13th Friday The Thirteenth! May 9th What Is This?